India is located in South Asia. Around 1700, the Mughal Empire ruled all of the sub-continent. It had Muslim influence and was at its peak. It then declined until the British ruled it from the mid-18th century. India was divided in princely states until it became an independent nation on August 15, 1947, thanks to Mahatma Gandhi. The rupee was first minted by Emperor Sher Shah who reigned from 1540 to 1545. This silver coin weighted 175 troy grains or 11.3 grams. The sub-unit was the paisa copper coin, from 45 to 65 paise to a rupee. During the British occupation, the rupee still is 11.3 grams of silver. however, new sub-units are used: 1 rupee= 16 annas = 64 paise ou pices = 192 pies. India moves to the decimal system in 1957. One rupees is then divided in 100 naya paise (new paise), later called only paise from 1964 on. Most Indian coins from 20th and 21st centuries use letterings in several languages. English is used on all coins since the British ruled India. It is one of the 23 official languages. The second mostly used language is Hindi (हिन्दी). It uses the Devanagari alphabet and writes left to right. Syllables are build from consonant clusters joined by an horizontal line. Vowels are either diacritics or independent characters. On each word, a top horizontal line connects all the characters. On some coins of the British era, other languages are used: Bengali (also spoken in Bangladesh), Punjabi (using Shahmukhi script and also spoken in Pakistan) and Telugu (spoken in Andhra Pradesh). The India national symbol shows on all coins from the Republic of India. It is the Lion Capital of Asoka (picture to the right and below). It was on top of a pillar built during the 3rd century BC by King Asoka in Sarnath, located in now Uttar Pradesh state. This capital includes four lions sitting back to back on a circular platform which displays the guardians of the four directions (lion to the north, elephant to the east, horse to the south and bull to the west). 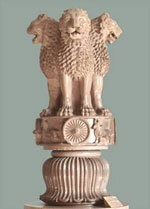 An Ashoka Chakra separates each of the guardian animals. The same Ashoka Chakra also ornates the India flag. Below the emblem, coins sometimes show the motto in Sanskrit सत्यमेव जयते (Satyam eva jayate), "Truth alone triumphs". The four lions are Indian lions, also called Asiatic lions. They represent power, courage, pride and confidence. 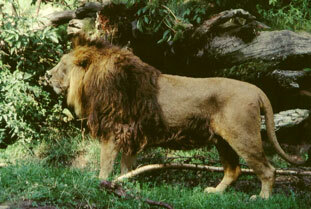 Asiatic lions are an endangered specie. About only 300 are left in Gir forest, India.